A - My theme for the A to Z Challenge this year is mythology. Over the course of April, I'll be blogging one myth or myth related subject a day (excluding Sundays). As per the A to Z Challenge rules, we'll begin with A and work our way through the alphabet. Today's mythical topic of choice is the Æsir (Aesir) and the Asynjur. The term Æsir is derived from the Germanic word áss (ase), which means god. The Æsir, of course, are the principal gods who make up the Norse pantheon. The Asynjur are their female counterparts. For the sake of simplicity, we're going to refer to both groups as the Æsir here. In total, fourteen gods and fourteen goddesses make up the Æsir, but good luck getting everyone to agree on which gods/goddesses should be included. Many lists, including that found in Gylfaginning (first book of the Prose Edda) leave Loki off the list because he's a pain in the áss (see what I did there? ;P). Others exclude Njord, Freyr and Freya who were, for all intents and purposes, hostages traded to the Æsir from the Vanir during the Æsir-Vanir wars. Yet others include the Vanir when speaking of the Æsir since the two pantheons combined after the war. This mighty war for dominion was one of the three myths used in the Great and Powerful Theme Reveal, found here. In Voluspo (a book of the Poetic Edda) we learn the history of the Æsir... from the creation of the world to its eventual prophesied doom at Ragnarök. While Odin, Vili, and Ve created the world initially, the Æsir (and all other races as well for that matter) continue to shape the Nine Worlds, building upon what came before. As a result, the Twelve Realms (Nine Worlds on Three Levels) are in a constant state of change... a concept that remains constant in Norse mythology, right up to the eventual destruction of the Æsir during Ragnarök (yep, they all die in a great big battle that rips the worlds apart and casts us back into Ginungagap - an endless, empty abyss... the Norse equivalent of chaos) and beyond, when the world is remade with Baldr (who returns from the underworld) at the helm. One of my favorite myths involving the Æsir (aside from the Ragnarök myth, of course) is the kidnapping of Idun. Far from the comforts of Asgard, Odin, Loki and Hœnir find themselves in a bit of a jam when the ox they killed won't cook. While they try to sort this out, the giant Thiazi, disguised as an eagle, snatches Loki away for a little chat. Thiazi desperately wants Idun and her magic apples for himself, so he convinces Loki to bring the goddess to him. Loki agrees to this dastardly plan. He is Loki, after-all. Upon his return to Asgard, Loki tricks the Goddess into leaving the safety of Asgard, where Thiazi waits for her. The giant grabs the Goddess and flies her away to his home in Thrymheim (an area inside Jotunheim). With Idun gone, the Æsir begin to age. Alarmed by this, the Æsir gather together to sort out where Idun has disappeared to. They eventually realize that she was last seen with Loki, and threaten all sorts of inventive torture and death upon him unless he returns Idun to Asgard. Freya helps Loki transform into a hawk (or an eagle depending on whom you ask), and he flies away to rescue Idun from Thiazi. When he gets to Thrymheim, he finds Idun alone. He quickly snatches her away, hoping to elude Thiazi altogether, but Loki's plans never work exactly like he hopes. When Thiazi returns and finds the Goddess missing, he races toward Asgard to take her back. But by the time Thiazi finds Loki and Idun, they are almost to Asgard. The other gods quickly build a fire along the walls of Asgard. Once Loki is safely through with Idun, they light the fire and poor Thiazi is torched. Safely home, Idun restores the Æsir to youth, and they're off on their next problematic adventure (also likely caused by Loki). If I related all those adventures to you, we'd be here forever. But if you'd like to read them for yourself, the Prose and Poetic Eddas are a great place to start. You can find them here. 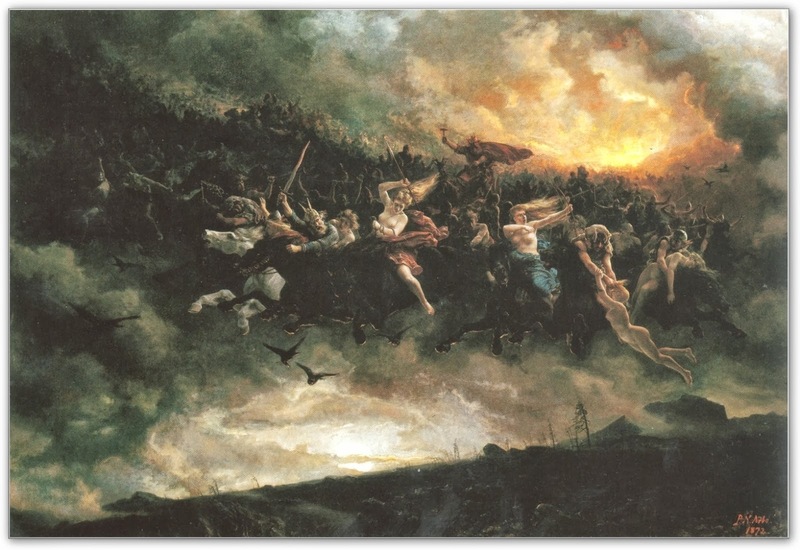 Do you have a favorite Norse myth? I am really excited you are doing mythology for your challenge. I really enjoy the stories. I have read into the Greeks a little, but as for the Norse, I have seen the Thor movies. I love the Thor movies. They are so much fun. I know very little about mythology, so thanks for this interesting post! This is a fascinating topic. I haven't read any mythology since high school (way too long ago.) It will be interesting to see how much I can learn this month. Loving the quirky summations! Thank you so much for this theme. It's awesome! This will be a good site for me to follow for the AtoZ Challenge, Alex because I know so little about mythology . . . at least, consciously. So much is tied to everyday living that I'm sure to recognize some things. Aloha. Great post! I have been interested in Norse mythology since one of my favorite authors started her new series, The United States of Asgard. Sorry my comment is so late, I had trouble finding where I was supposed to start on the huge list of participating blogs. If you have time, feel free to check out my A post. I've not heard of that series yet. I'm definitely going to have to check it out! Who is the author? I'll also hope over and visit you during the challenge. Thanks so much for stopping by.